Context is crucial in making big data useful, and the key to that context is often location. Move over, smart grid. A new buzz phrase has bumped you out of first place in utility IT: big data. As with smart grid, no one really knows what big data means. We know it’s big in information technology, though. And I’m even not sure that the term “big data” is even grammatically correct. I recently interviewed a candidate for a job and asked him what he knew about GIS. In his response he mentioned big data perhaps 10 times and smart grid only seven. I concluded that big data was now bigger in the utility IT space than smart grid. In utilities, the biggest type of big data is interval meter reads. These come from new smart meters—not part of the smart grid, per se, but rather advanced metering infrastructure (AMI). AMI differs from automatic metering (AMR), which the utility business bumped from being a buzz word several years ago. As you can see it’s not easy keeping up with these trends. Big data from smart meters feeds into user-friendly dashboards, providing decision-makers the context they need to move faster and more strategically. But the buzz around big data has more to do with its value than its volume, velocity, or variety. If a customer wants to reduce consumption and save money, for instance, it’s more important to know what in the home is consuming power during a high consumption interval than knowing the five-minute granularity of their consumption data. The value comes from putting big data in context. Think about big data in politics, where context is everything. A Democrat running against a Republican for the presidential campaign is one thing. The same candidates running against each other during a time of huge economic turmoil and high unemployment, both leftover from a Republican president, puts the election in a whole new context. Especially when the Republican candidate is very wealthy. Of course, I mean the presidential election of 1936. Seriously. In a Literary Digest survey of the 1936 campaign, the majority of 2.5 million Americans said they would vote for the Republican, Alf Landon. Yet you may recall from high school that Franklin Roosevelt won the 1936 presidential election. It was the biggest landslide election in history. Since then, pollsters such as Gallop and others learned that sheer data volume doesn’t predict anything. Context is what really matters. If Literary Digest had asked a few contextual questions, they may have discovered that the people who returned the survey tended to vote Republican anyway. What does all this have to do with spatial information and GIS? Even in politics, location matters. In fact it matters a lot. 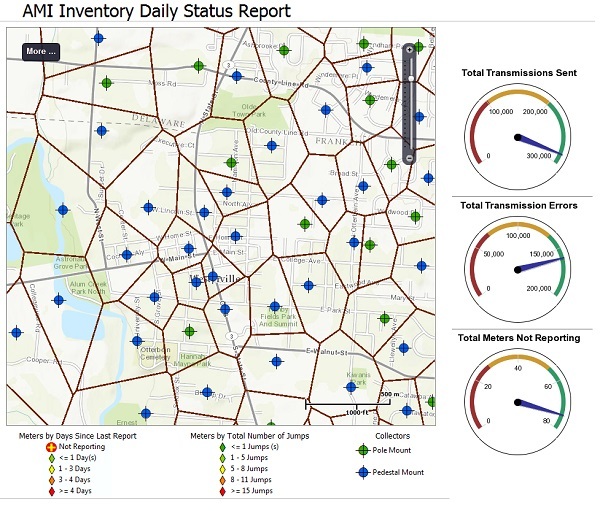 If a utility wants to use its meter consumption data to drive better business decisions, it needs to look at the geographic context of all this AMI data. What’s the relationship between consumption and demographics? Between consumption and weather patterns? Between consumption and shifting populations? How will a certain consumption pattern affect the low-voltage wires and transformers feeding neighborhoods? Where will the adoption of electric vehicles have the most negative impact? How will utilities assess changes in pricing policies? Who will be the winners and losers? More importantly, where will they be? And what will they be thinking and doing when the policies change? Big data plays a role in understanding that. It plays the central role. And its critical context is location. Another critical source of big data is social networking. This information can be misleading if not contextualized. Imagine that a utility looked only at negative customer tweets. They might get one impression. But not every population segment tweets. So now imagine the utility could mine that social-media data. It could know which kinds of people are tweeting negatively. It could integrate that data with their GIS and spatially enable customer satisfaction surveys to target those people who hold strong opinions. Perhaps the negative tweets are coming from a neighborhood where outages have been frequent, construction has inconvenienced customers, or where the utility has cut down beloved trees. Big data in context creates actionable intelligence. Big data out of context? It’s a bad bet. The challenge for utilities will be to avoid using big data—from AMI, SCADA, customer information systems, real-time weather sources—in isolation. But the payoff lies in combining this data with a geographic context. To learn more about big data, click here.